"Is Richard Handy really my friend?" It's been one year, two weeks, and three days since Samuel Hoenig opened the doors of Questions Answered. The personality traits of his Asperger's Syndrome help him maintain objectivity - a critical component of his business's continuing success. But when Tyler Clayton, a young man who also has Asperger's, asks if a store clerk is truly his friend, Samuel, for the first time, can't bear to give an objective answer. It's a dicey situation that only gets worse when one of the key players ends up dead. Resolving to do the right thing, Samuel, with help from his associate Ms. Washburn, wades into the murky waters of friendship, and the answer he finds may be a revelation to himself most of all. ©2016 E.J. 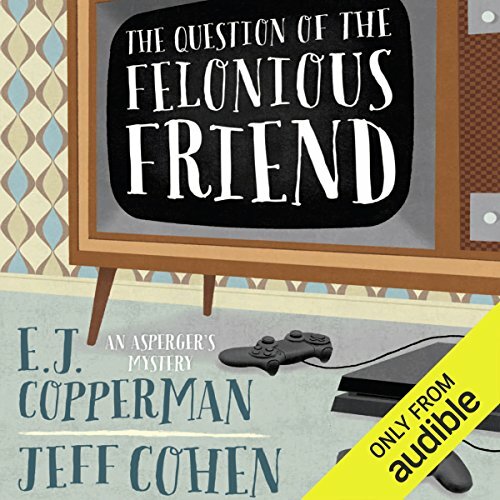 Copperman and Jeff Cohen (P)2016 Audible, Inc. I love this series! The character of Samuel is well developed and likeable, and his sidekicks, "Mother" and Mrs. Washburn, play off him perfectly. The concept of answering a question for a business is intriguing, and I like how the author turns the question into a mystery. Samuel reminds me a little bit of Mr. Monk, and his unique perspectives help solve the mystery. I also like that Mrs. Washburn is given credit for her contributions and is more than just a potential love interest for Samuel. This is the third in the series, but the first one I listened to on audio. I thought that the audio version would make Samuel come alive as I have found in some series, but I found that the printed versions were just as enjoyable. Good humor, psychologically accurate, reminds one that people are NOT their "disorders." Very entertaining listen. please bring in the other books to audible!!! These books are original and fun and the narration brings them to a whole other level that is very important in understanding the different personality, as Sam would say it. if you enjoy it please request the content from audible. Samuel Hoenig, proprietor of Questions Answered, has been asked a new question. Is Richard Handy really my friend? The question presents a problem for Samuel, as his Aspergers leaves him highly objective, but the question is not an objective one. His client, Tyler, is a young man also on the autism spectrum, and not equipped to answer this question for himself, a point of significance for Samuel and his associate, Miss Washburn. They take the question. They were not surprised to ascertain that Richard Handy was not really Tyler's friend, but when Richard is shot and the police find Samuel's client standing over the body with the gun, answering the question of who shot Richard Handy proves much more difficult. Tyler has confessed. I really do enjoy these cozy mysteries. After the fashion of Dame Agatha, it's always that one thing we didn't know that clinches these plots together. This story, while still very enjoyable, has a bit of a plot hole. There are explanations around it, but none of them are especially satisfying. Not a major point of contention for me. I enjoyed where this one ended. Aspergers is an interesting topic. I think as my third novel you waste too much time speaking about it. When the author gets past explaining every, and I mean every, detail of life on the autism and allied disorders spectrum - then I will read another in the series.